The music for the video is a movement of one of the pieces Betsy/St Mary's Singers sang in Kew on Sunday 21st. It's not actually us singing, though. An unimpressive performance at the quiz at the Gardeners' tonight: third-last, I think. We wiped out due to a lack of knowledge of BAFTA-winning films. Good fun, though. Our team name was Hutch and the Gorillapods (despite nobody ever calling me Hutch). I'm not sure Nicola and Chris knew they were in the frame of this photo, taken at 21.40. I went in to town at lunchtime today to buy a Gorillapod. Walking through the Westgate centre at 13.19, I got this photo of a beautiful long eared owl, which was being displayed to publicise the work of the Barn Owl Centre. Jaipur may be the best curry house on the Cowley Road. They do a very good chicken shashlick: here's an example. I ate it tonight, with Leen and John, and caught it on camera at 21.03. Here's a classic Oxford gargoyle on the side of St John's college. Taken at 21.40 on my way back from choir. Despite snow this morning, I failed to take an interesting photo today, so this was taken on Magdalen Road on my way home, in some desperation, at 21.11. Feeling absolutely exhausted this evening, after such a busy weekend and the first session of my new gym regime this evening, which requires me to do some weights after a spin class. Evil. Our concert went really well. We had loads of mayors, as you can see, and a good audience. Dad took this photo at 17.18, as the mayor of Richmond thanked everyone for coming. I'll take this opportunity to thank those of you reading this who were able to make it - I appreciate your support, and hope you enjoyed it. A long, tiring, successful day of rehearsing today for tomorrow's gig was followed by a good dinner at Cafe Mamma on Kew Road. Our waiter took this photo at 22.14. It's Betsy weekend at last: we're singing a concert in the Barn Church in Kew on Sunday afternoon (flyer). We went to Hannah's house in Hither Green for dinner and for a quick rehearsal. Annoyingly, I forgot to take a photo while we were all there, so this is just a few of us on the train back towards Richmond, at 22.46. Rubbish weather in Oxford today, so this was taken at 22.12 as Leen and I walked across Donnington Bridge. I went to the Ash Wednesday service in New College today. They sang Allegri's Miserere better than I've ever heard it sung before: it was magical. I took this photo at 19.38 after the congregation had left. Went to see Tenelle perform with her band, The Keys, at the Wheatsheaf tonight. Here she is, on stage at 21.31. I recorded the final song of The Keys' set, Malestrom Lullaby. Listen to it at http://audioboo.fm/boos/98596-the-keys-malestrom-lullaby. Leen cooked a tasty stir fry with ingredients from her first organic veg box. Taken at 20.32. Today we went to Cotswold Wildlife Park, which was brilliant. It was difficult to choose just one picture, but the winner is an Amur Leopard, taken at 14.57. More photos from the weekend on Facebook. Leen and I went to White Horse Hill near Uffington. The views were particularly dramatic because the sun was in and out, with threatening clouds around too. Photo of Leen standing on top of the defensive ditch of Uffington Castle at 15.03. There are more photos from the weekend on Facebook. This is a very slow exposure (around 5 seconds I think) photo of the OUP quad, taken as I left work at 18.24. Went for a walk around Worcester College at lunchtime to check for evidence of spring. There were snowdrops, but there will be lots more next week so I'm going to try again. Perhaps Tuesday! This picture shows Rich's garden and house in college. Taken at 12.42. Leen and I went to see a concert in Christchurch cathedral tonight. Students of the Christchurch music society performed Poulenc, Rachmaninoff, Walton, and Bartok. The cathedral is my favourite building in Oxford, but I didn't get a decent photo in there so I took this picture of the staircase up to the dining hall on our way out, at 21.12. These elderly files contain bits of the OED. Taken at 19.46 as I left work. Did the quiz at the Gardeners' Arms tonight, with Leen, Chris, and Chris' friend Kevin. We didn't do very well, wiping out due to our lack of knowledge of Philip Pullman novels. Someone at the next table took this photo of us at 21.00. Laura, Will, Zoë and Martin came to visit today, which was great. We went to the Waterman's Arms for lunch, for a walk by the river, enjoyed the excellent Steampunk exhibition (three weeks left, be sure to see it), then visited the King's Arms, Café Tarifa, and the Kazbar. Photo taken by a tourist in Radcliffe Square at 15.00. Inflatable Buddha played their first gig in ages at the Cape of Good Hope tonight. Fun. Photo taken at 22.23. Today I got glasses for the first time ever. After work I watched Frost/Nixon on Blu-ray at Rich's - imagine how sharp that looked to me! - and then joined Leen and her friend Sarah in All Bar One, where Sarah took this photo at 22.47. I didn't do anything photogenic today I'm afraid, so Whisky's the star again. Taken at 22.08 in our living room, and without a flash, so her eyes don't look as frightening as they did on January 11. Jubilate spent the second half of tonight's rehearsal singing Vaughan Williams and Britten in Keble chapel. I ducked out for a couple of minutes to take this photo from the pulpit at 21.11. A sad day for the Cowley Road, as its only independent DVD rental shop, Videosyncratic, closed down. 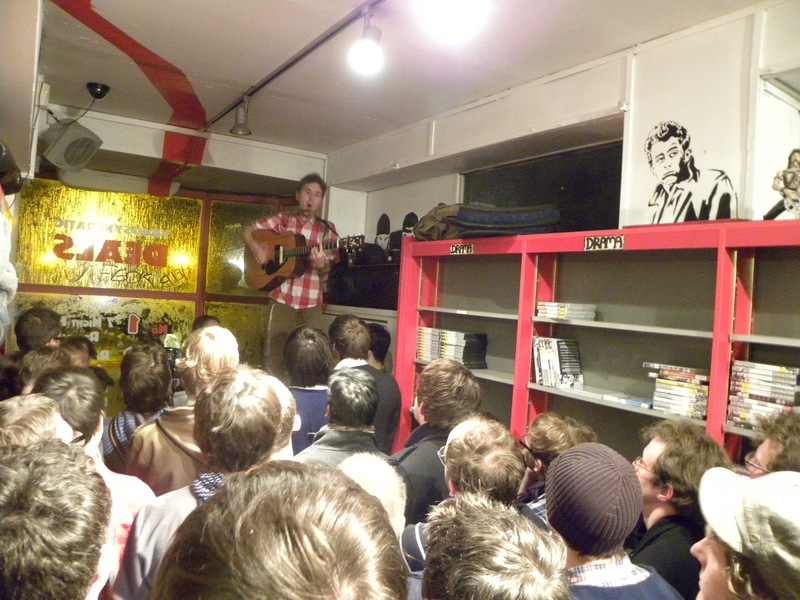 It went out with a bang, though, in the form of a free gig and massive DVD and comic sale. A fun atmosphere, and the place was absolutely packed, particularly for Stornoway's set. I couldn't actually see the band as I couldn't get in the room, but I took this photo, at 21.38, by sticking my hand round the corner.